Matilda will stay in her own little house for the next few weeks as the chicks grow a little bigger, they are currently the size of golf balls! We’ve sectioned off part of the pen so that the other hens can’t come and see them for the time being. This is so the chicks stay safe in case some of the other hens take a dislike to them. Everyone is smitten with them, they ludicrously fluffy and very inquisitive, jumping all over poor mum. Matilda is doing a sterling job and they have had a lesson in scratching and eating today. The chicks spend most of their time hidden, folded inside Matilda’s warm feathers. 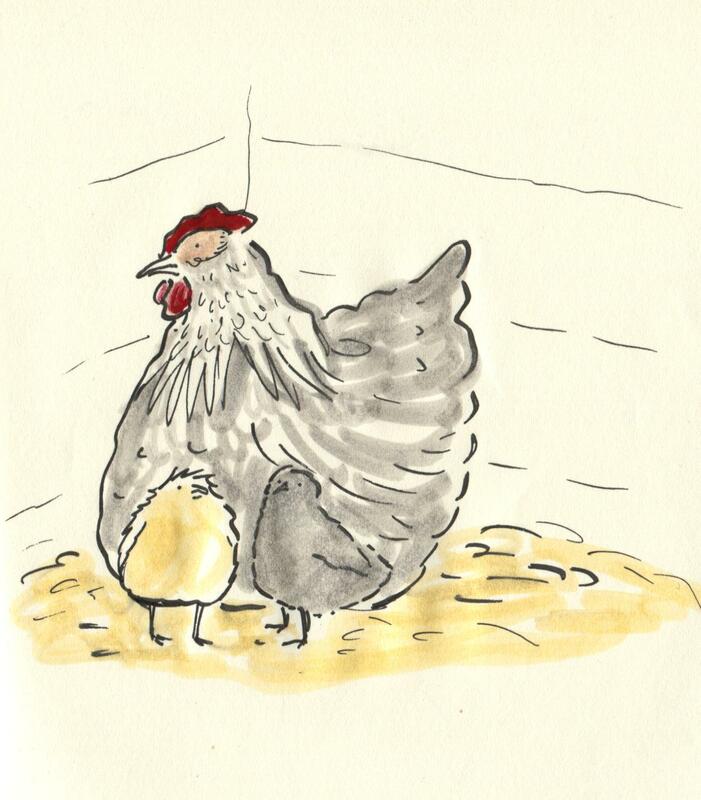 Posted on May 11, 2014, in Uncategorized and tagged Chickens, Doodlemum, Drawing, Family, Illustration, Life, Pen and Ink, Sketchbook. Bookmark the permalink. 12 Comments. Thank you for the update … so excited for you! What are you going to call them? Something from Doctor Who, I’ll be bound. A delightful post. Thank you. What a lovely chick-pic! I hope Matilda is keeping her strength up. Maybe one of them will grow up to be He-man 2. Ha haaa! Love those chicks! !